Our dog-friendly areas are not so friendly due to piles of dog waste. Dogipot is the clean and green solution to dog pollution. Dogipot supplies the highest quality, environmentally conscious pet waste removal products to help keep your dog-friendly areas free from the unsightly, smelly and harmful nuisance of dog waste by shifting the responsibility of picking up dog waste to the dog owners and away from maintenance or staff. We'd like our park to be more kid-friendly, but adult-size picnic tables aren't well-suited to children. Children will enjoy outdoor activities more if the furniture is built to fit them. Pilot Rock Kids Picnic Tables have the dimensions to fit children up to 10 or 11 years old. Square, round and rectangular tables in bright colors are perfect site complements to colorful play areas at parks, schools and rec centers. But children can be hard on things, so Pilot Rock has built each kids table to the same specifications of their full-scale tables. Annual re-application of our landscape and safety surface mulch is cost-prohibitive. Pinnacle Rubber Mulch is an eco-friendly and high-performance ground cover that won't compress, providing excellent drainage for plants while at the same time suppressing weeds. And unlike wood, Pinnacle Rubber Mulch resists erosion and will not decompose. Exposed electrical cords are creating a safety hazard and a design obstruction at our facility. Everlast with Nike Grind's UltraTile recycled rubber tiles feature a unique pedestal underside that provides resilient support and helps to prevent cable clutter by routing fitness equipment wiring beneath the surface. 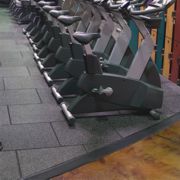 The modular 1-inch thick tiles surpass the noise and shock absorption qualities of any other fitness floor and feature a dowel installation system for easy movement or replacement. How can we keep our courts clean without cutting back on playing time? The best way to keep your sports floors in top-notch condition is with a daily maintenance schedule. Courtclean® effectively picks up dirt and dust, and it's easy to use. Reduce your maintenance costs, avoid slip-and-fall injuries, and prevent the spread of bacteria. When your floors shine, they're a true reflection of your rec center. Courtclean® helps provide the clean you can see. Show your concern for the safety and sanitary conditions of your facility, and everyone will take notice. We are adding a walking/jogging trail to our park. We want a surface that is durable, while also providing traction and shock absorption for users. What is our best option? ECOtrailTM from Surface America is ideal for high-traffic areas like running, walking and jogging paths. With one to two pounds of recycled rubber per square foot, ECOtrail is a resilient, long-lasting surface designed with exceptional shock absorption. Its porous design means quick drainage and no puddles. We are looking for some shelter for an event. Whether you're looking for shelter for an event or you just want to gain some exposure while doing business, KD Kanopy is the company for you. With breathtaking canopies, outstanding graphics and a wide variety of signage products, KD Kanopy is the industry leader for all your canopy branding needs. Loading and unloading kayaks or canoes can be difficult, especially for those with disabilities. The new EZ Launch® for Kayaks and Canoes is the first and only port system built specifically for paddlers. The EZ Launch system utilizes rollers that allow the kayak or canoe to be raised out of the water, making a stable access platform. The hand and guide rails make it easy to "glide" on and off the EZ Launch for users of all abilities.